Owning the same truck for 44 years is quite an accomplishment. 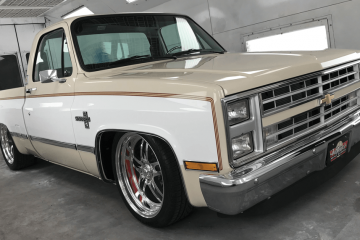 Not many custom truck enthusiasts can walk out into the garage and climb into the same cab they have been enjoying seat time in for more than four decades. In all seriousness, 44 years is a long time, and for a man to hold onto a truck through the ups and downs of business and family life is remarkable. 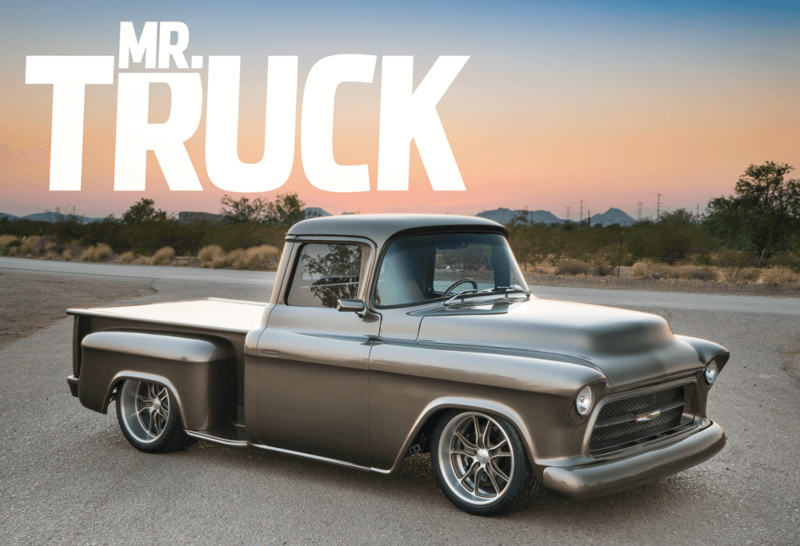 Randy Whiteside’s journey with the ’55 Chevy pickup radiating off of these pages started in 1974 when his brother Ron brought the truck home, retiring it from daily service as the shop truck for Dana Radiator. 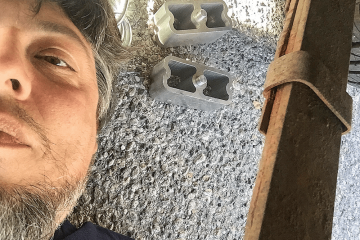 Randy and Ron disassembled the truck on Labor Day weekend that year and had everything sandblasted, only to find significant amounts of rust. A lap through the local bone yard netted some clean replacement body panels, and the brothers cleaned and painted the chassis and laid on a coat of primer. Fit with a 355-ci LTI, a top-loader four-speed and a 9-inch rearend, Randy cruised through the late ’70s in his freshened Chevy. BUDNIK G10 BRUSHED WHEELS WITH CERAMIC BRONZE INSERTS PROVIDE THE PERFECT PRO TOURING LOOK, WHILE MICHELIN PILOT SUPER SPORT RUBBER DOES THE PAVEMENT PUNISHING. WILWOOD BRAKES PROVIDE SAFE AND FAST BRAKING PERFORMANCE AT ALL FOUR CORNERS. 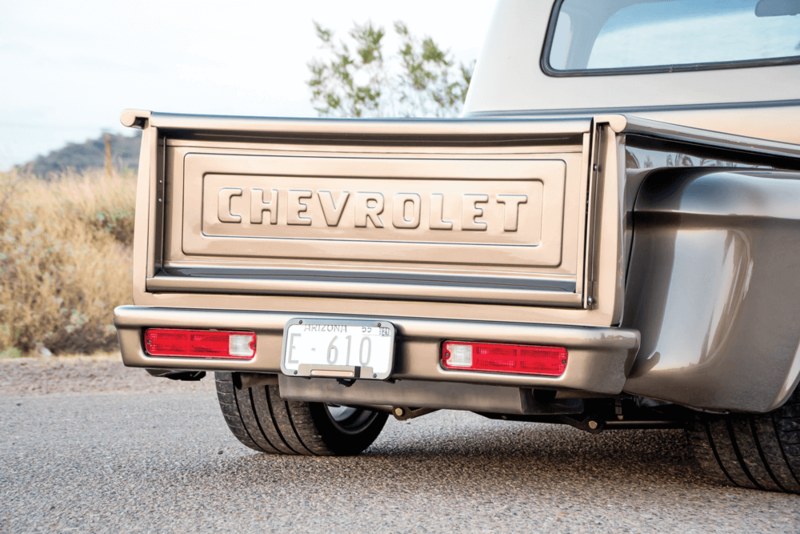 Working in their parents’ carport on nights and weekends, the brothers progressed the truck through the various styles of the ’70s, ’80s and ’90s. In the ’80s, the old double nickel bow tie got a Ford LTD front end to convert the old straight axle to IFS with power disc brakes. In 1982, Randy met John Boyle, an expert body man and metal fabricator, and the two struck up a friendship. Boyle agreed to modify the bed to fit Randy’s extra wide ’70s wheel-and-tire combo. THE BED INCLUDES A BLEND OF VARIOUS CHEVROLET STYLES INCLUDING BEDSIDES FROM A 1963 CHEVY AND A MODIFIED EL CAMINO REAR BUMPER. THE BED RAILS HAVE ALSO BEEN CAPPED AND SMOOTHED AT THE ENDS FOR A FLAWLESS, FINISHED LOOK. 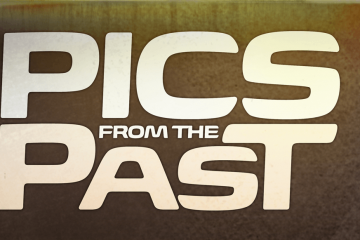 Fast forward eight years and along came the ’90s. 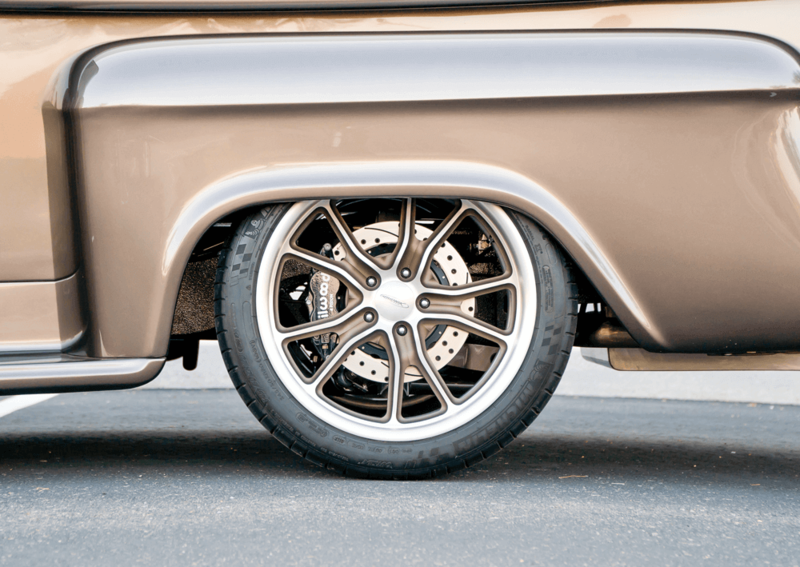 In went a 515-hp blown 383 backed by a TCI Turbo 400 transmission, a narrowed 9-inch rearend with a custom four-bar and coil-overs by Randy and Boyle, and of course, the requisite ’90s Pro Street steamroller rear rubber stuffed into the step-side fenders. Cue the pastel tank tops, OP shorts and Oakley Blade sunglasses. In 1992, after Ken Gartman and Don Mackey reworked the dash and fabricated the gas filler door into the rear fender, Tom Kegler (Kegler Custom) rolled the truck into his spray booth and applied some color, which was the first time the truck had worn anything but battleship gray primer since 1974. 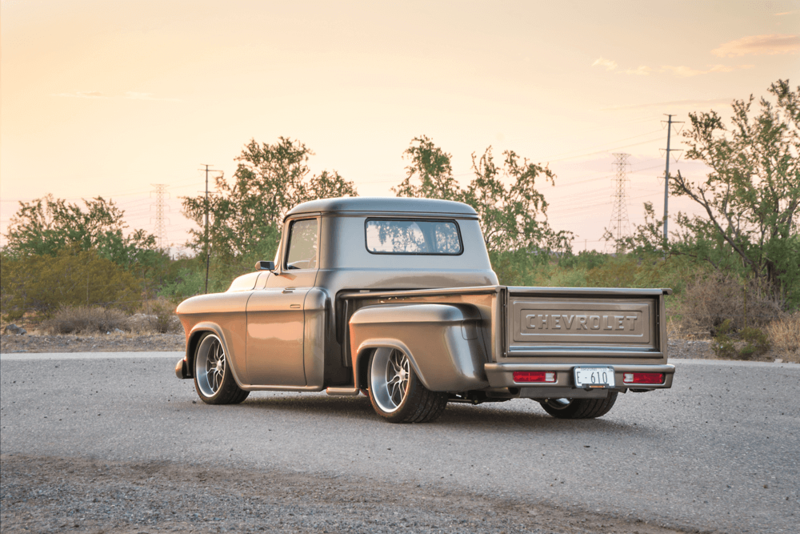 A 525-HP LS3 SENDS THIS CLASSIC CHEVY DOWN THE ROAD WITH EASE. In 2003, Randy pulled the motor out to freshen it up while the truck went to California to have a new IFS grafted on. When the truck returned to Arizona, the new front end presented another setback, or a step forward, depending on how you look at it. The shop that performed the front-end upgrade had forgotten that the wheelbase was 2 inches longer than stock and had welded the new IFS in the stock location, making it extremely difficult to rehang the front sheet metal. At this stage of the build game Randy lost interest and the project was sidelined for nine years. In 2012 he decided he wasn’t getting any younger and it was time to finish the truck once and for all. To get the ultimate custom bones for this classic bow tie hauler, Randy contacted The Roadster Shop and had the team build a Fast Track chassis complete with RS independent front and rear suspension. Wilwood 13-inch four-piston brakes handle rear deceleration duties. Under the nose of this wicked pavement-pounder lies AFCO adjustable coil-overs, Z06 Corvette spindles and Wilwood 13-inch rotors with six-piston calipers. Wilwood dual master cylinders get fluid to the big Wilwood binders, which show nicely through the window openings of the 19×19-inch front and 20×12-inch rear Budnik G10 wheels mounted on Michelin Pilot P265/35ZR19 front and P345/30ZR20 rear rubber. WHEN RANDY’S DAUGHTER BREENA WAS 2 YEARS OLD SHE NICKNAMED THE CHEVY MR. TRUCK, AND THE NAME STUCK. To make this old bow tie brick run like the wind, Turn Key Engine Supply in Oceanside, California, assembled a 376-ci 525-hp LS3, which delivers 486 ft-lbs of asphalt-ripping torque. The late-model mill breathes with ASA CNC-ported heads, TRS modified stainless headers feed into a custom-fabricated stainless exhaust courtesy of Boyle. 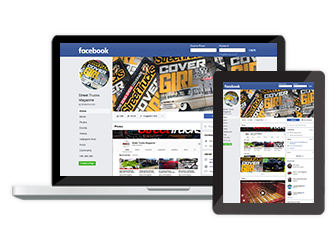 Magnaflow mufflers handle throttle and gear change tones. 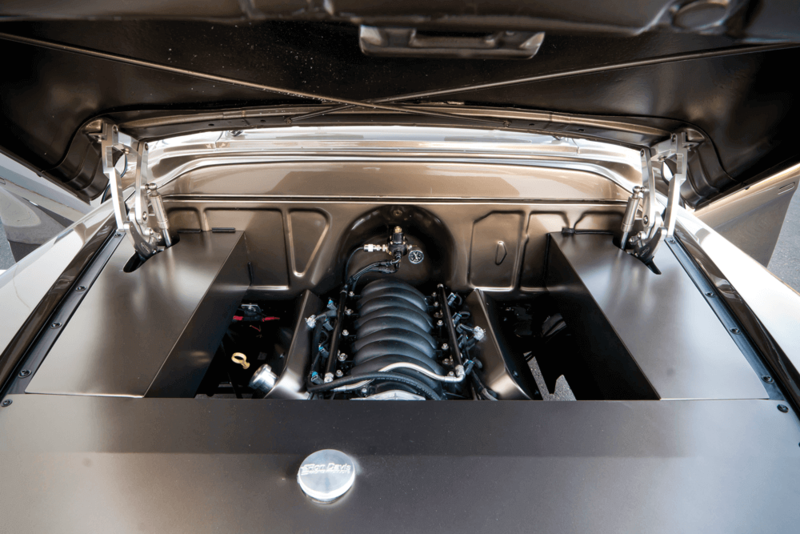 A Ron Davis radiator keeps things cool, while a K&N air intake speeds initial air flow, and a Vintage Air accessory drive system spins the LS smoothly and freely. A custom-built 4L70-E overdrive transmission fit with a 2,800 stall speed converter handles gear commands with a custom chrome-moly driveshaft linking the gear box and rearend. 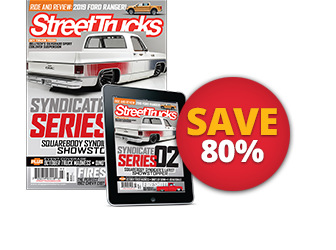 Now that the chassis, suspension and drivetrain were in check to form a killer asphalt-kicking hot-rod pickup, Randy turned his attention to the body. His friend Kegler handled paint duties once again and laid down PPG Charcoal. A massed 1955 front bumper by Kegler and a custom grille by Randy and Boyle redefines the nose, while a massaged rear El Camino bumper adorns the 1963 Chevy long bed Boyle customized. A custom gas filler by Gartman and a custom bed floor and tonneau cover by Boyle are further accented by Kindigit Design door handles. ARMANDO’S CUSTOM UPHOLSTERY PERFORMED THE SLICK STITCH WORK ON THE INTERIOR. A BUDNIK WHEEL, DAKOTA DIGITAL GAUGES AND A VINTAGE AIR CLIMATE CONTROL SYSTEM CONTRIBUTE TO CRUISING COMFORT. Before adding new upholstery, Gary Schalge, a retired GM master mechanic, repinned the computers to make the LS rumble and the transmission shift like butter. Ed Mowtown from ERM Performance massaged the hp tuner’s software to smooth perfection, and Tim Benedict performed the four-wheel independent steering alignment and tuned the braking and steering systems for optimum performance. For driving beats, Bob Brackey installed and cleanly wired the JBL speakers and Kenwood amps. 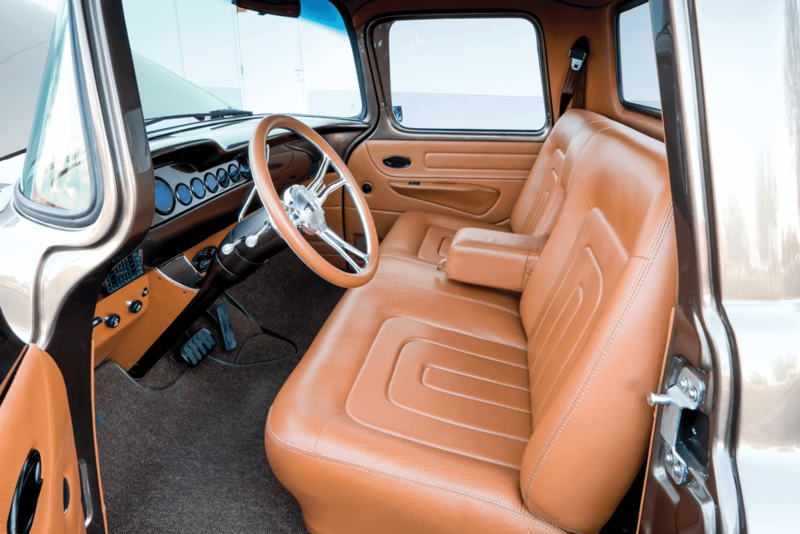 To get the cab up to par, Randy delivered the truck to Armando’s Custom Upholstery in San Jacinto, California, where Armando Sr. and Jr., George and Able worked their slick stitch magic on the cab’s innards. Leather covers the seat and door panels, and a thick Mercedes wool carpet was draped over the floor. A Budnik billet steering wheel handles driver input in style, while Dakota Digital gauges and a Vintage Air climate control system provide modern creature cruising comforts. 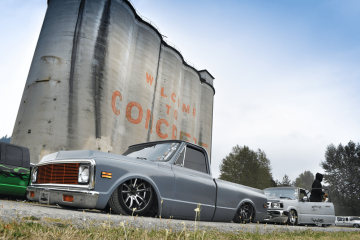 Randy Whiteside, with the help of some dedicated hot-rodding friends and a supportive family, has created a sharp classic Chevy hauler capable of flat-footed, straight-line fun, as well as some corner-carving on twisty roads. 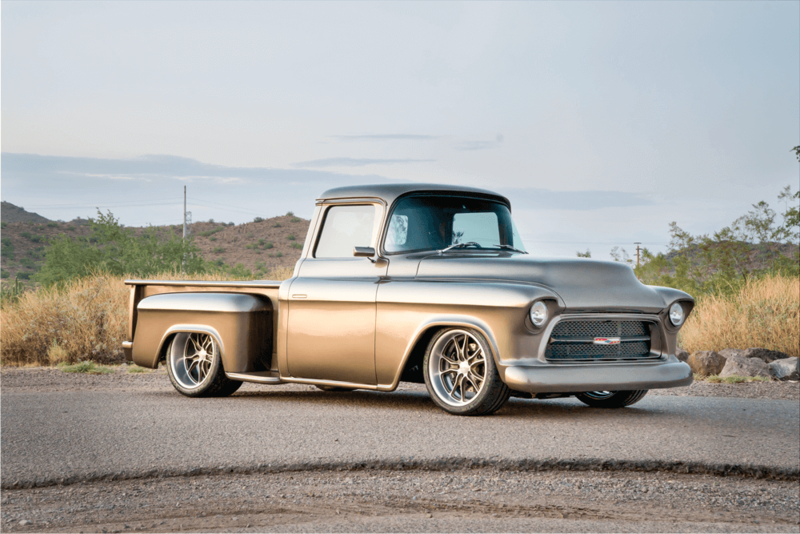 The modern LS3 power, RS underpinnings, big Wilwoods capped with a sinister-looking combo of Budnik wheels and Michelin rubber give the truck all of the modern power and handling of a sports car in a classic truck package. The stealthy paint finish combined with subtle body modifications and a stylish cruising chamber finish the truck just right, and Randy is not afraid to drive it long distances. Here’s to another 44 years of the Whiteside family enjoying Mr. Truck. 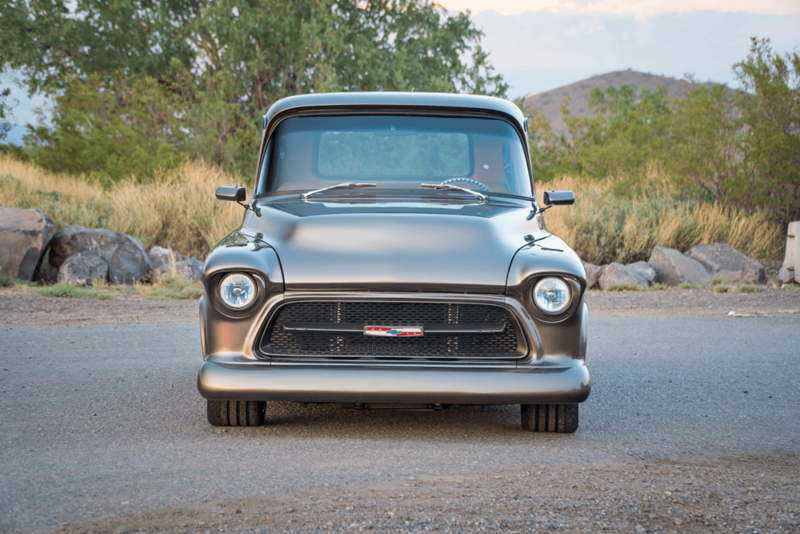 THE ROADSTER SHOP CHASSIS SETS THE TRUCK AT THE PERFECT RIDE HEIGHT, WHILE THE CUSTOM GRILLE, SMOOTHED FRONT BUMPER AND SHAVED SIGNAL MARKERS GIVE THE FRONT END A MEAN, CLEAN LOOK.